Warning: if you’re on the ICFP program committee and want to preserve double-blind reviewing, please ignore this post. I’ve been working on an ICFP paper called “Tangible Functional Programming”, revising my last year’s submission on Eros. If you’re interested in taking a look, I’d greatly appreciate any comments, especially before the April 6 submission deadline. We present a user-friendly approach to unifying program creation and execution, based on a notion of “tangible values” (TVs), which are visible and interactive GUI manifestations of pure values. Programming happens by gestural composition of TVs. Our goal is to give end-users the ability to create parameterized, composable content without imposing the usual abstract and linguistic working style of programmers. We hope that such a system will put the essence of programming into the hands of many more people, and in particular people with artistic/visual creative style. In realizing this vision, we develop algebras for visual presentation and for “deep” function application, where function and argument may both be nested within a structure of tuples, functions, etc. Composition gestures are translated into chains of combinators that act simultaneously on statically typed values and their visualizations. Here is a figure from the paper, showing one stage of an interactively composed interactive 2D region. The user selects compatibly-typed input and output widgets, typically in different TVs. The result is a new TV that merges the source TVs, except for the connected input and output, which vanish. 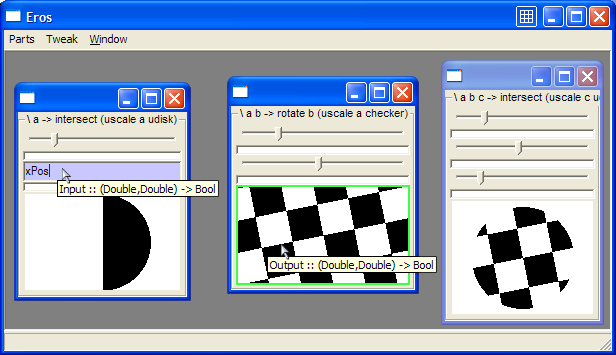 The sliders control the disk and checker sizes and the checker’s rotation angle. Last week I released three Haskell libraries: DeepArrow 0.0, Phooey 0.1, and TV 0.0. These libraries came from Eros, which aims at creating a right-brain-friendly (concrete, non-linguistic) “programming” process. I’ve had a growing intuition over the last fifteen years that media authoring tools can be usefully looked at as environments for functional programming. I’d been wondering how to map a user’s gestures into operations on a functional program. Lots of noodling led to ideas of composable interfaces and “tangible values” (term thanks to Sean Seefried) and gestural composition in Eros. Phooey is a functional GUI library that has much of Eros’s GUI implementation techniques, but much more carefully structured than in the Eros paper. Although these libraries came from Eros, I’d like to see other applications as well. Where am I going with library development? Figure out how to support simple GUIs and Eros’s gesturally composable GUIs, without code/library replication. Re-implement Eros on top of simpler pieces. Refactor Pajama into reusable libraries and release. Edit of March 5, 2007: TV is now split into a core TV package, with no GUI functionality, and GuiTV, with Phooey-based GUI creation. The reason for the split is that Phooey depends on wxHaskell, which can be difficult to install.